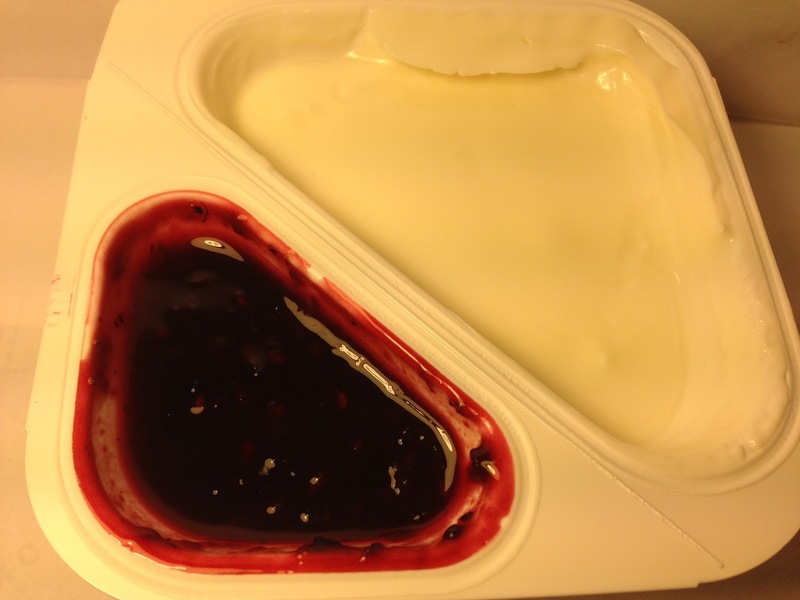 Due to a new product introduction of Muller products at my local grocery stores, I exhausted myself on a series of Muller reviews. 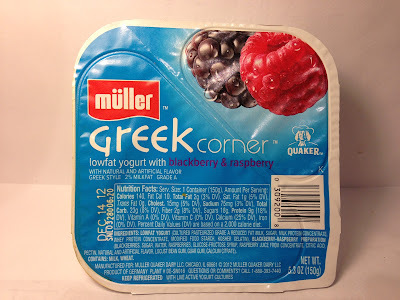 Despite my exhaustion, my foolish personality sees fit to continue to review product until the end of time, so that leads me to another review of a Muller Greek Corner product with this review of the Muller Greek Corner Lowfat Yogurt with Blackberry & Raspberry single serving cup. I picked this one up at an even more special 11/$10 sale at Kroger, so the unit price is about $0.91. Each cup is 5.3 ounces and has 140 calories with nine grams of protein. Since this is from Muller's Corner line of lowfat Greek yogurts, the design of the container does not differ from the others, nor does the basic yogurt. What does differ is the fruit included and in this case, it's a mix of blueberries and raspberries. One thing that is noticeable about this fruit mix is that there were a ton of blackberry and raspberry chunks. In fact, while most of the other mixes were smooth and jam-like, this was was more of a stew, if you get what I mean. There were bits of fruit and seeds everywhere and I certainly didn't expect that. While neither encouraging or discouraging, it was not expected. The fruit themselves permeated an odor of both of their namesakes, although I will say that the blackberry smell was stronger. In most instances, if the smell is stronger that usually means that the taste is going to be stronger too and that was definitely the case with this mix. While I could taste each fruit when I really concentrated, the primary and dominating taste was that of the blackberries. What I did notice was that when you mix two tart fruits together, the mix becomes extremely tart and while I didn't mind that, others certainly might. Also, a kind of fun aspect of this "stew" mixture with large fruit pieces was that the seed bits almost made this crunchy to go through as I was eating it. Totally unexpected, but a totally welcome addition. The yogurt was basic stuff, but what it did do was calm down the tartness of the fruit mix when I blended them together. What it did was add a cooling and muting effect to the tart fruit mixture, which it kind of needed before it overpowered everything. Buy It or Fly By It? I like tart foods like lemons, blackberries, etc., so this one was a delight in my book and I'll give it a BUY IT rating. The tartness may be a bit too much for some people even with the cooling effect of the Greek yogurt, but it was not too much for me and I thoroughly enjoyed it. If you like tart (or either or both of these berries), this is the product for you.